The sequence viewer of OpenStructure can be used to display sequences or alignments. It is possible to display the data in different ways. To change the display style, click the tool icon of the menubar and select the display style from the list. This mode is only available, when a mol.EntityView is connected to the sequence. This display style uses the seq.alg.Conservation()-Algorithm which calculates the Conservation for each column. This Mode is only available for alignments. This implementation of conservation colors the columns grey, if all amino acids are from the same type. If all amino acids are from the same group, it colors the column with a light grey. Otherwise the column is colored white. This Mode is also only available for alignments. With the sequence viewer of Openstructure it is possible to zoom in and out <ctrl + mousewheel> . 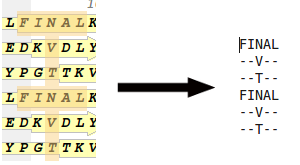 It is possible to copy sequence text from the sequence viewer by pressing <ctrl + c> . If you paste the text (for example into a text editor), all the gaps will be filled with - . With <ctrl + f> you can show or hide the search bar which help you finding parts of a sequence. The SequenceViewer class represents a graphical sequence viewer. To see the sequences of a gfx.Entity, you can use the AddEntity() method. If you want to load an alignment, the AddAlignment() method can be used. Remove entity from sequence viewer. Remove alignment from sequence viewer. Change the display style of all alignments and sequences to the given style. If the obj parameter is given, it changes only the display style of the given object. Returns the current display style. If there are objects with different display styles, ” ” will be returned otherwise the string of the display style. Returns a list with all available display styles. If you pass an object, you will get only the display styles for the given object. Get the SIP-QObject (QWidget), learn more about Mixing PyQt and C++ Widgets.